Whether you’re a 3-reel or 5-reel pokies player, Microgaming have you covered when it comes to their Fruit Fiesta title. Offering both formats, the 3-reel option features three paylines, while the 5-reel version features 15 paylines. The two are quite different aesthetically, but both offer a progressive eligible for player to trigger. Both versions of Fruit Fiesta pokies have just a single coin denomination for the bet size, with the 3-reel variant set at 0.25, and 0.05 for the 5-reel option. There’s just three coins eligible to be played on the 3-reel title, and 15 on the 5-reel game, but both have a maximum bet of $0.75. With such a low maximum bet, especially when there is a progressive involved, low rollers will love these titles – but medium to high rollers might want to stick to Microgaming’s bigger progressives, such as Mega Moolah. Both feature the backing noise of a land-based casino – the sounds of mechanical pokies and people chattering away – but you can mute the audio in the top right hand corner of the game screens. Additionally, both offer a RTP between 90-91%, which is somewhat low, compared to other titles, due to the progressive jackpots attached – which are also connected. This is where the the two pokies differ quite significantly. We will start with the 3-reel version since it was released first. The layout of the 3-reel option is quite simplistic, with the reels in the top hand corner and the paytable surrounding them – there’s no button to click to view the payouts as all the information is on the one screen. It is a true fruit machine with the perfect theme to match. 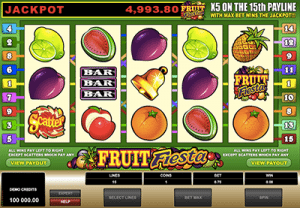 The 5-reel Fruit Fiesta sees the reels taking up the entire screen, with a simple green backdrop and a paytable button. You will be taken to another screen to view the possible payouts if you click on it. Both display the jackpot amount, which will be the same since the two titles are connected – if someone wins the jackpot on the 5-reel option it will restart on both titles and visa versa. Both variants available by the top leading provider feature similar, bright graphics but the 5-reel option is an enhanced version. 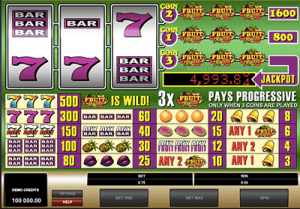 The symbols on the 3-reel Fruit Fiesta pokie are classic fruit symbols, including the Sevens (multiple colours, each payout differently), BARs, Liberty Bell, oranges, plums, watermelons, the Fruit Fiesta Logo, and pineapples. There are 20 available winning combinations, with three rainbow colour Sevens paying the highest payout of 500 coins. The Fruit Fiesta logo is also the Wild and if you score three of these you will trigger the progressive, provided you are playing the maximum bet (which is only $0.75 per spin). Since this title takes after the video pokie format, there are a few more symbols added to the reels – though we still see many of the classic fruit machine symbols. The lower paying symbols are represented by the bell, the plum, and the orange, with five oranges scoring you 180 coins. The middle value symbols are represented by the watermelon, the pineapple, and the bar symbols, with five bar symbols scoring you 400 coins. Finally, the high value symbols are represented by the apple, the lemon, and the rainbow Sevens, with five rainbow Sevens scoring you 750 coins. There’s also the same Wild – represented by the Fruit Fiesta logo – but this time it pays up to 9000 coins (by spinning five), as well as triggering the progressive jackpot by spinning five on the 15th payline. You need to have all 15 paylines activated to do this, but this is still a bet of $0.75 per spin. The Scatter is an additional symbol, represented by fruit salad cut up and the text ‘Scatter’ across it, and offers a payout of up to 400 coins by spinning five. Since there aren’t any special bonus features on the two titles, except for the Wild substituting for symbols (excluding the Scatter) on the 5-reel option, we only have the progressive jackpot to detail. The two titles have connecting progressive jackpots, which we mentioned above, in that it is the one jackpot for both games. So when a player spins the reels using real money on one title, they are contributing to the jackpot for both. Once it has been hit, on the 3-reel or 5-reel Fruit Fiesta titles, it restarts on both. Players need to spin three Wilds on the 3-reel pokie at maximum bet, or five Wilds on the 15th payline on the 5-reel title. The progressive is generally in the four to five figure range. Microgaming have brought out many of the same titles with different formats, for example Major Millions 3-reel and 5-reel variants, Game of Thrones featuring 15 paylines or 243 ways to win, and more. We have to say we prefer the 5-reel version as video pokies are more our style, but if you are after a classic fruit machine the 3-reel variant is a great option thanks to the progressive. We would’ve preferred to see more features to the video pokie version, such as a Free Spins feature or a Pick Me bonus, but for those who enjoy the original and wanted to see it in video pokie form, Microgaming have done just that.